In Yellowstone, elk are normally considered bit players in the dramas that play out between people and wildlife. While the incredibly remote likelihood of getting attacked by a grizzly bear is what distills collective fear, the reality is that temperamental bison have caused more harm to visitors than any other larger animal. Yet for the second time in three days, a person has been injured by a protective elk mother. 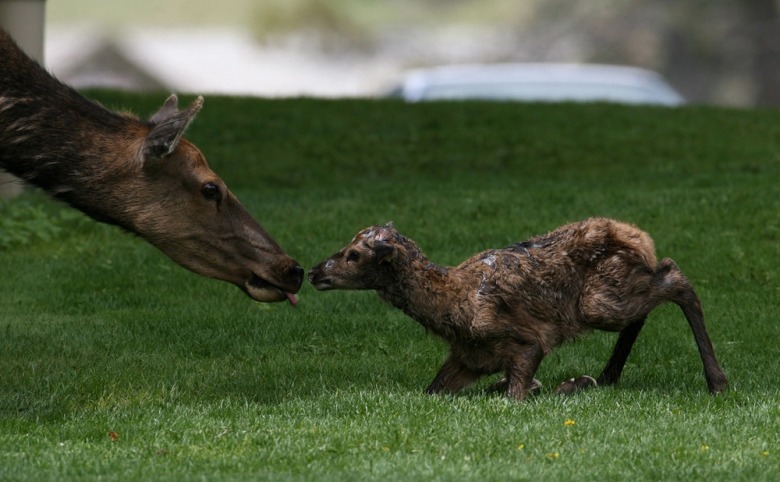 On the morning of Tuesday, June 5, a 53-year-old woman from Cypress, Texas was kicked by a cow wapiti on the lawns at Mammoth Hot Springs surrounding Yellowstone’s official park headquarters. 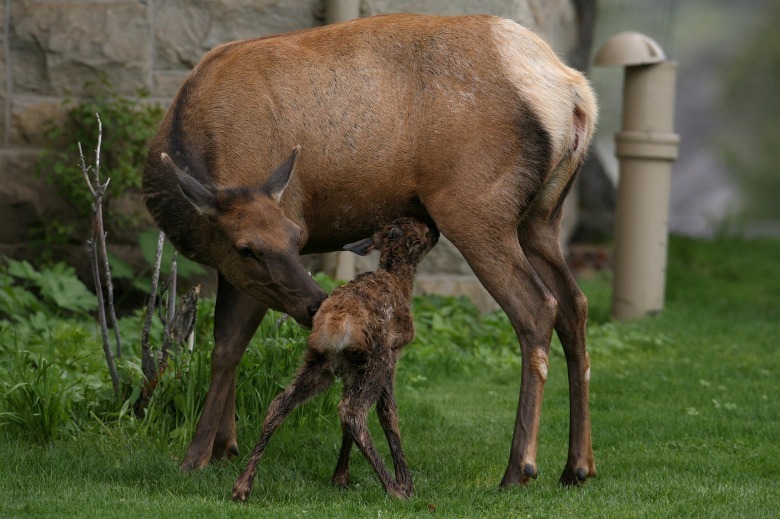 Penny Allyson Behr appeared to accidentally happen upon the female elk which was lounging on the grass with her calf. “She attempted to back away but the elk pursued and struck her with its legs in the head and torso,” the Yellowstone public affairs office wrote in a press release. Ms. Behr was taken by ambulance to Livingston Memorial Hospital in Montana. Her condition at this time is unknown. It was the second such encounter between a person and an elk this week. 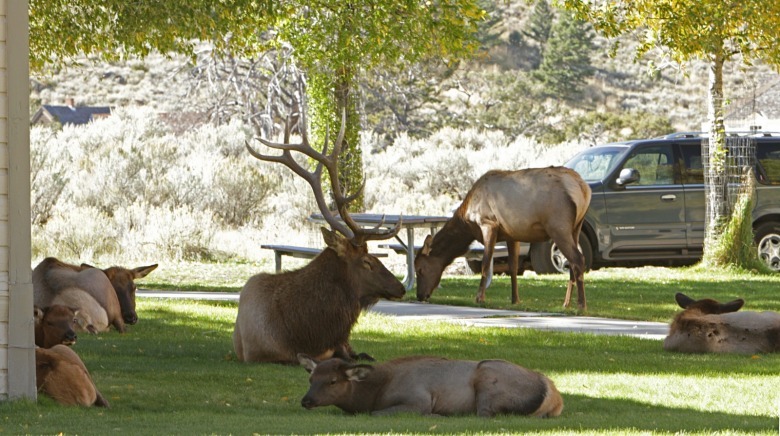 On Sunday, June 3, 51-year-old Charlene Triplett from Las Vegas, Nevada and who is working in the park for concessionaire Xanterra, was kicked several times by a cow elk behind the Mammoth Hot Springs Hotel. 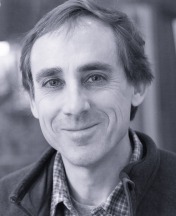 Due to the severity of injuries to her head, torso and back, Triplett was flown to the trauma center at Eastern Idaho Regional Medical Center in Idaho Falls, Idaho. Elk often gather around Mammoth Hot Springs, both in the spring and early summer after cow elk give birth to their calves and in autumn when bugling bulls vie for the attention of breeding females. Park officials say that no matter how docile elk appear, it is important to give them a wide berth of at least 25 yards. No citations were issued in either the Behr or Triplett incidents and no action was taken against the elk. On May 1, a 72-year-old woman from Boise, Idaho was head-butted in the leg by a bison as she walked along a trail in the Old Faithful area. Grizzly bear-inflicted injuries to humans in developed areas averaged approximately one per year during the 1930s through the 1950s, and four per year during the 1960s. Grizzly bear-caused human injuries in developed areas then decreased to one injury every two years (0.5/year) during the 1970s. Since 1980, there have been only two (0.1/year) grizzly bear-caused human injuries in developed areas, an average of approximately one every 18 years. Over the same time span, there have been 34 human injuries caused by grizzly bears in the backcountry: an average of one per year, according to the park. Again, bison have injured more people in Yellowstone than any other animal. For more on safety related to wildlife and other phenomena in Yellowstone, click here.